Nice of Ryan to send me good wishes! I can't believe it's been six months since I started this blog! I thought I'd be lucky to last six weeks.... and yet here I am celebrating my first half birthday! 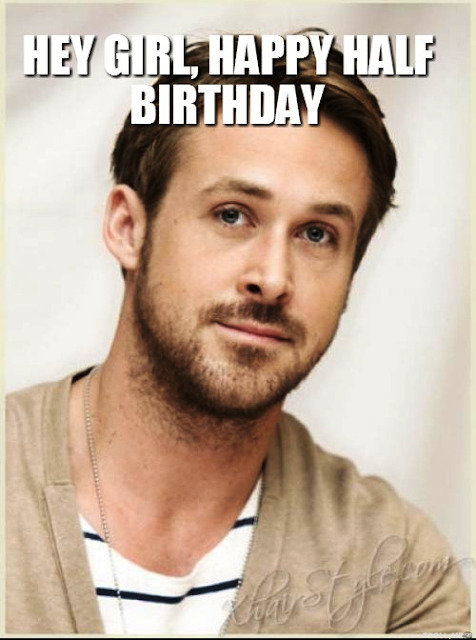 Seeing that I didn't even know there was any such thing as a half birthday prior to writing this blog, it shows how far I've come in the last six months of blogging - and to have a picture of Ryan Gosling as part of my post also means that I've gotten into the whole "meme" thing without even trying! It's been a really fun journey so far and I am so pleased with all the friends I've been making along the way - thanks girls! Anyway.....to celebrate this momentous occasion I've made a few cosmetic changes to my blog page - changed the colours (I was getting tired of the green) and freshened things up a little bit. I have a new header picture that I think reflects the blog better and I'm feeling a lot more positive than when I originally started writing six months ago. It's a nice to feel content with where I'm at and to be looking forward to what the future holds. I like the idea or having a good think every six months or so and adding or subtracting things that I think need to change (in my blog AND in my life!). I don't imagine I'll be swapping blog platforms or anything exciting at this stage - I'm a microbe in the ocean of blogging and Blogger meets my needs very nicely and will do for a long time to come. Thank you to those of you who pop by to read and say hi every so often - it's been lovely sharing the journey with you so far and I look forward to many more half birthdays ahead! I do like your knew look and that photo header is beautiful. I did like the old one too but I agree this one is fresher. Happy Half Birthday girl. Thanks for the encouraging words Kathleen - I thought the new header summed up how I'm feeling at the time being! Oh yeah, Ryan and I expect that we'll be celebrating more milestones with you in the future! Thanks Mithra - it was lovely of you and Ryan to stop by and join my party - I do hope I'll be around for a few more! Love the header photo - she looks so happy and free! I am always assessing how my blog looks, if my ads are ok, if my sidebar is working. Maintaining a blog takes a lot of time! Thanks for reminding me that I'm due for a blog overhaul. Now that you've made it to your 6 month blogging birthday (congrats by the way), I'd urge you to reconsider staying on as a blogspot blog. It might be time to migrate to wordpress.org and "own" your own blog---because right now, Google owns it (of course, don't they own everything?) If you haven't claimed the crestingthehill.com url, at least do that. Write on! I am constantly changing things up on my blog. It's like changing the furniture around in my house. I get tired of looking at the same old things day in and day out. I love how yours is looking! 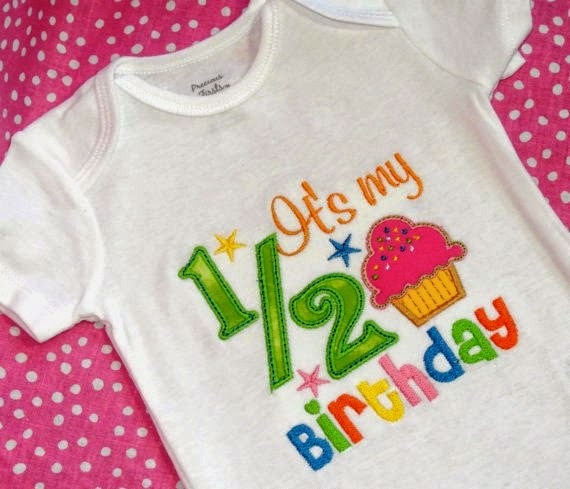 Happy blogging birthday! Happy half birthday, Leanne! I really like the new layout. It took me more than 2 years to go self-hosted. You have time, my dear. Congrats on the feature of #FridayBlogBooster! 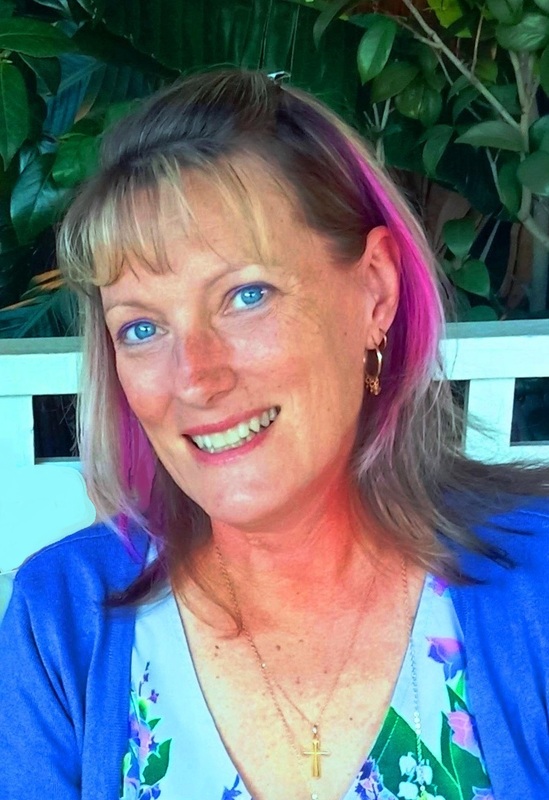 Hi Kathy - thanks for the positive words (your specialty!) feel free to eat cake in my honour! Happy ½! Nice of Ryan. Fun to change things up and I wish you many more ½'s and whole ! I love the new look - and your outlook! Happy half birthday - and here's to many more! I have loved Blogger, and have no plans to relocate either. Looking forward to your future posts. I am stopping by (again) to let you know that I featured your blog on my Shout Out Saturday blog of May.